Russet Burbank is a potato cultivar with dark brown skin and few eyes that is the most widely grown potato in North America. 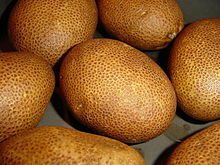 A russet type, its flesh is white, dry, and mealy, and it is good for baking, mashing, and french fries (chips). It is a common and popular potato. This variety is a mutation (or sport) of the cultivar 'Burbank' that was selected by the plant breeder Luther Burbank. The known lineage of Russet Burbank began in 1851 when Chauncey E. Goodrich imported Rough Purple Chili Potato from South America in an attempt to add diversity to American potato stocks which were susceptible to late blight. Goodrich bred Garnet Chili from Rough Purple Chili and Albert Bresee bred Early Rose from Garnet Chili, from which Luther Burbank bred Burbank. All the crosses were open pollinated and only the maternal parents are known. Russet Burbank has widely, but incorrectly, been reported to have selected in 1914 by the Colorado potato grower Lou D. Sweet. A 2014 study confirmed that it was originally released in 1902 by L. L. May & Co and was first known as Netted Gem. To improve the disease resistance of Irish potatoes, Luther Burbank selected the potato that became known as "the Burbank". It was not patented because plants such as potatoes propagated from tubers, were not granted patents in the United States. Russet Burbank was not initially popular, accounting for only 4% of potatoes in the US in 1930. The introduction of irrigation in Idaho increased its popularity as growers found it produced large potatoes that were easily marketed as baking potatoes. The invention of frozen french fries in the '40s and fast food restaurants in the '50s increased its popularity further. By the 2010s, Russet Burbank accounted for 70% of the processed potato market in North America, and over 40% of the potato growing area in the US. Restaurants such as McDonald's favor russet potatoes for their size, which produce long pieces suitable for french fries. As of 2009, "McDonald's top tuber is the Russet Burbank". After decades of consumption in North America, consumers and processors consider it the standard potato against which others are judged. The Russet Burbank plants are medium sized with stems that have a medium thickness that are prominently angled. The leaves of this variety are medium sized with large terminal and primary leaflets. The flowers of the plant are medium sized with dark green buds that drop readily. The variety has large, long tubers that are cylindrical or slightly flat. There are numerous eyes on the potato that are evenly distributed and the sprouts are a brownish purple colour. The Russet Burbank variety stores very well for long periods of time. It can be stored at 7°C for up to five months without the need to apply gasses that inhibit sprouting. One issue that can occur while in storage is internal black spot, also known as IBS. Also, if the potatoes are harvested too early there could be a skinning issue. Russet Burbank is highly resistant to black leg. It is moderately resistant to common scab and fusarium dry rot (Fusarium oxysporum and F. sambucinum). It is susceptible to fusarium dry rot (F. coeruleum), late blight, leaf roll, seed-piece decay, tuber net necrosis, verticillium wilt, PVX and PVY. ^ a b c d e f Bethke, Paul C.; Nassar, Atef M. K.; Kubow, Stan; Leclerc, Yves N.; Li, Xiu-Qing; Haroon, Muhammad; Molen, Teresa; Bamberg, John; Martin, Max; Donnelly, Danielle J. (2014). "History and Origin of Russet Burbank (Netted Gem) a Sport of Burbank". American Journal of Potato Research. 91 (6): 594–609. doi:10.1007/s12230-014-9397-5. ^ "Baked". Retrieved 15 April 2013. ^ a b c James Lang (2001). "The American Potato". Notes of a Potato Watcher. International Potato Center. pp. 43–47. ISBN 978-1-58544-138-9. ^ Daniel Kevles (2002). A history of patenting life in the United States with comparative attention to Europe and Canada: a report to the European Group on Ethics in Science and New Technologies. hdl:1805/757. ^ Bruce Watson (23 September 2009). "McDonald's prepares to switch its fries to a greener potato". Daily Finance. Archived from the original on 27 November 2015. ^ a b Directorate, Government of Canada, Canadian Food Inspection Agency, Plant Health and Biosecurity (2001-12-17). "Russet Burbank". www.inspection.gc.ca. Retrieved 2016-11-30. ^ Network, University of Nebraska-Lincoln | Web Developer (2015-09-17). "RUSSET BURBANK: MANAGEMENT PROFILE | CropWatch". cropwatch.unl.edu. Retrieved 2016-11-30. This page was last edited on 11 March 2019, at 22:41 (UTC).